Author Gavin Extence is younger than I am. He is a national chess champion, holds a Ph.D. in film studies, and has written a novel that has gotten many rave reviews. He makes me feel old and unaccomplished. As Extence notes, the book is about the friendship between British teenager Alex Woods and ex-pat American Isaac Peterson. The book spans six years—from the time Alex is struck by a meteorite when he’s eleven years old until shortly after Mr. Peterson dies. Alex is a smart, quirky, conscientious kid who can’t decide if he wants to be a physicist or a neurologist when he grows up. He gets bullied a lot and suffers from epilepsy (a side effect of being hit on the head by a meteorite). Mr. Peterson is a widowed, grumpy Vietnam vet who spends his days smoking a lot of weed and writing a lot of Amnesty International letters. The two meet by chance in Mr. Peterson’s backyard and, after a bit of a rocky start, become pals. Their friendship blossoms after Mr. Peterson introduces Alex to Kurt Vonnegut’s body of work. Alex begins a book club (with Mr. Peterson and several other adults from their village) to read all fourteen of Vonnegut’s novels and explore “all or some of the following: morality, ecology, time travel, extraterrestrial life, twentieth-century history, humanism, humour, et cetera.” But the theme in Vonnegut’s work that is especially important to Mr. Peterson as he rereads Timequake, the last book-club book, is not one that Alex sets out to explore; it is the importance of free will. This is the concept that drives the rest of the book. As Mr. Peterson becomes increasing ill, Alex recognizes the value of free will and what that requires of him as a friend. While not a character in the book per se, Vonnegut certainly plays a significant part in the novel. Make no bones about it: Gavin Extence is a fan. Here is a short piece he wrote for HuffPo called “Most of What I Know about Writing, I Learned from Kurt Vonnegut.” Two of the things that Extence mentions admiring about Vonnegut are: “1) The simplicity of his style,” and his handling of “2) The big ideas.” This book is clearly an homage to Vonnegut, and Extence succeeds in using a simple style and discussing big ideas (among them illness, euthanasia, and right versus wrong). But Extence is new to the book-writing business, and there are times when that is evident in his writing. There were parts that dragged, parts that were fun and interesting but didn’t seem to go anywhere, and parts on which Extence could have elaborated. He spends time developing interesting secondary characters (like Alex’s tarot-card reading mother and his emo-goth friend Ellie), but their roles in the novel are insignificant. The relationship between Alex and Mr. Peterson is likeable, but I always felt a bit disconnected from them. That said, Extence has still published one more novel (and gotten one more Ph.D. and won several more chess championships) than I have, so I think he’s doing OK. Plus, his next book will be better; he’s still finding his own voice. Alex is, by design, very cerebral. As the narrator, he views all of the “big issues” through an extremely logical, and sometimes not very relatable, lens. The idea of the book is a good one, even if it isn’t executed perfectly. Who should read it: Kurt Vonnegut fans (who will delight in the sprinkling of quotations and references and the general sense of Extence’s unadulterated adoration present throughout the novel); ISTJs (I’m speaking here of the Myers-Briggs personality type: Introverted, Sensing, Thinking, Judging, which both Alex and Mr. Peterson appear to be. My guess is that Extence is, too). If you really have a hankering to read a book about an unlikely friendship, illness, and euthanasia, consider reading: Me Before You by Jojo Moyes. The concept is similar, but it is a little more relatable for people who are driven by both logic and emotion. 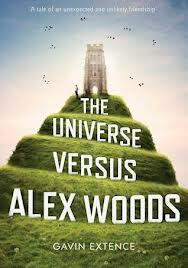 This entry was posted in Rating: 3/5 and tagged Alex Woods, Book review, Books, Gavin Extence, The Universe Versus Alex Woods. Bookmark the permalink.